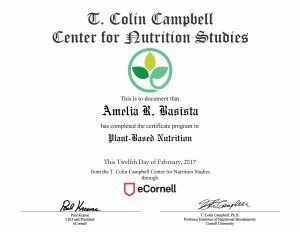 We’re excited to announce that Amelia has earned her Plant-Based Nutrition Certification from the eCornell and T. Colin Campbell Center for Nutrition Studies. The Plant-Based Nutrition Certificate offered in partnership with eCornell is a revolutionary online program that will help you understand the importance of diet and nutrition for your life. 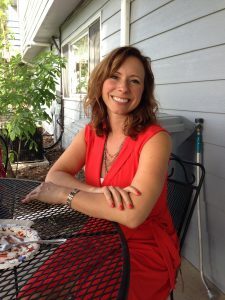 Through video presentations with over 25 experts (MDs, PhDs, RDs, RNs, etc. ), research and perspectives are provided to emphasize why following a plant-based diet and lifestyle is optimal for health — including the prevention and reversal of diseases such as diabetes, heart disease and cancer. This online certificate program provides you the opportunity to examine historic and contemporary research, learn the steps for practical application in your life, and be better prepared to educate others. The whole-food plant-based nutrition information Amelia learned through this program is invaluable, and will help guide our vegan recipe creation and vegan meal plans. As a result of this program, we’ll be substantially reducing or completely eliminating (where possible), the use of oil, salt and added sugar. It’s our goal to help people transition to a healthy vegan diet from the Standard American Diet, so we’ll continue to only share recipes that taste great for both vegans and non-vegans. That means we’ll still occasionally use these “bad” ingredients when they’re critical to the flavor of the recipe. However, we’ve already been able to modify many of our recipes to exclude these ingredients without sacrificing their deliciousness. If your goal is to eliminate them completely, try using substitutes or leaving them out when you prepare the recipe and let us know how it went in the recipe comments. 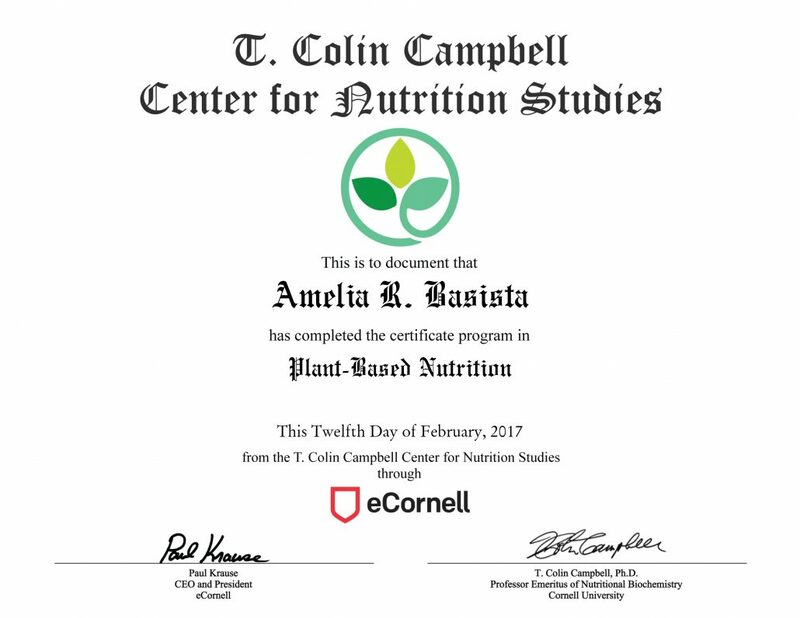 Congratulations to Amelia for doing the hard work in her not-so-spare time to complete this Plant-Based Nutrition Certification from the eCornell and T. Colin Campbell Center for Nutrition Studies! Talk to Amelia about your plant-based journey.